SAS to get a Seamster GMT Special Edition too? – I Already Have a Watch. Thanks to a tip from a fellow enthusiast with connections to some of the personnel concerned, I’ve learned that following in the tracks of the SBS, the British Special Air Service is now reported to be getting their own Omega Seamaster Professional Co-Axial GMTs as well. Purportedly the watch will be almost identical to the SBS LE, but with the SAS logo printed on the inner side of the sapphire back like many recent Omega Speedmaster limited edition series. Each member will be allowed to purchase only one. The SAS watch will include the “zap number” engraving like on the SBS edition, though the SAS “zap number” marking is reported to include the owner’s initials as well. It’s not clear if this is simply a means to help identify the owner if the watch is lost/stolen or else just to discourage resale. A few years ago the SAS pursued a special watch through Breitling’s military sales program, a Seawolf with the SAS insignia printed on the dial. Supposedly the Breitling was not well-liked, however, though it had little to do with the performance or specifications of the watch itself: the logo on the dial presented a security risk. 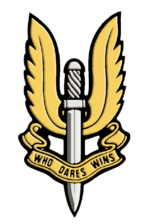 Members of the highly secretive SAS are not even allowed to acknowledge membership in the unit. With the Omega GMT at least the logo is hidden from view when the watch is worn. I can’t imagine Breitling would have voluntarily given up the publicity opportunity provided by the relationship with the famous unit, so presumably the SAS either decided they liked the Omega better or else preferred the more discreet placement of the logo. And as reported previously, the Seamasters are known to be highly popular within the British military anyway so it does seem a more logical choice.